Bear River’s Garrett Pratt (18) drags a Capital Christian defender during Thursday’s win. 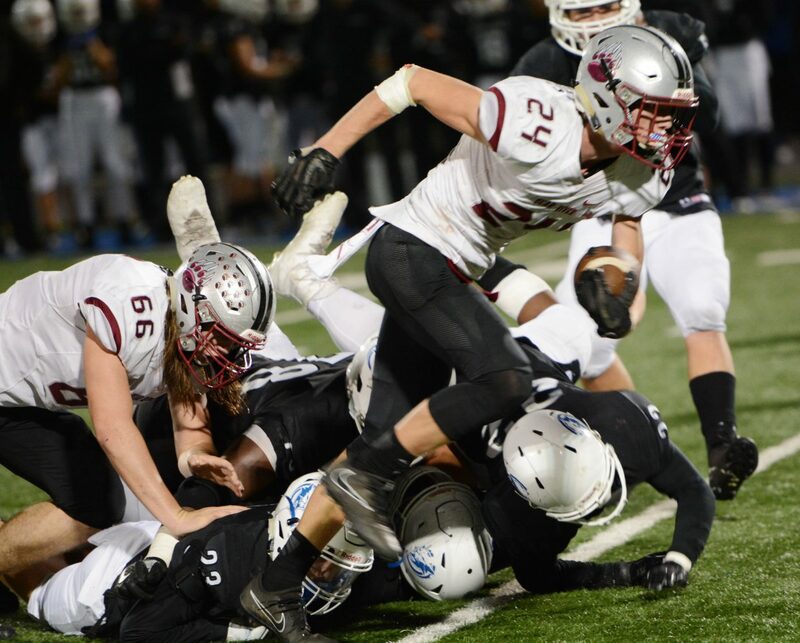 Bear River’s Tre Maronic (24) makes his way through Capital Christian defenders during the Bruins’ 26 – 7 win over the Cougars Thursday night in Sacramento. 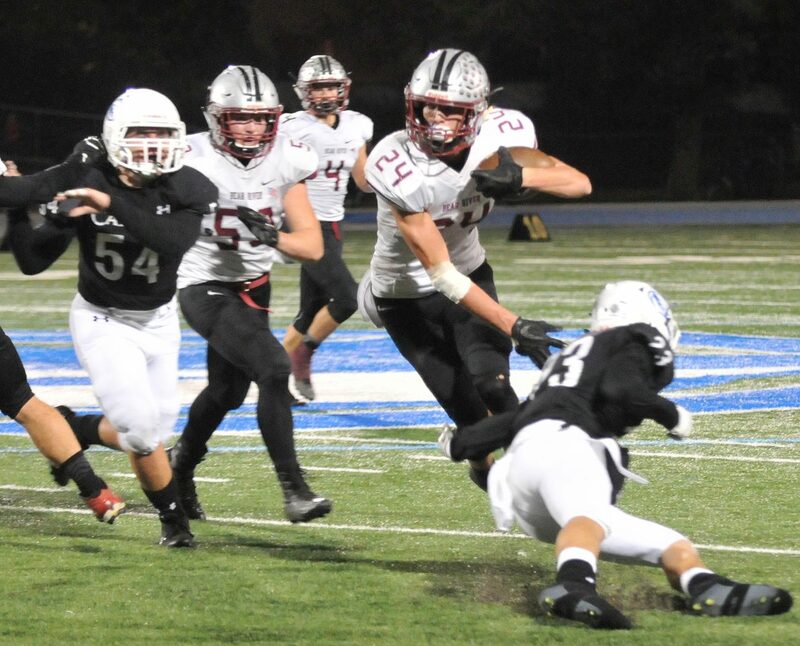 Bear River quarterback Luke Bagget (4) fires off a pass before getting tackled by the Capital Christian defense. Members of the 2017 Bear River varsity football team pose for a group photo after becoming victorious in the Division V first round playoff win over Capital Christian. 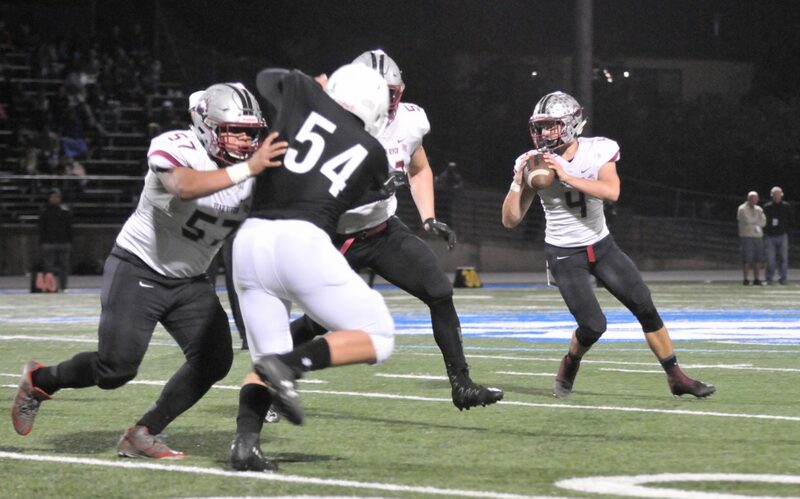 A slew of Bear River defenders take down Capital Christian quarterback Jake Cruz (6) in the backfield during the Bruins’ first round Division V playoff win over the Cougars Thursday night in Sacramento. Bear River quarterback Luke Bagget looks for an open receiver while under pressure by the Capital Christian defense. 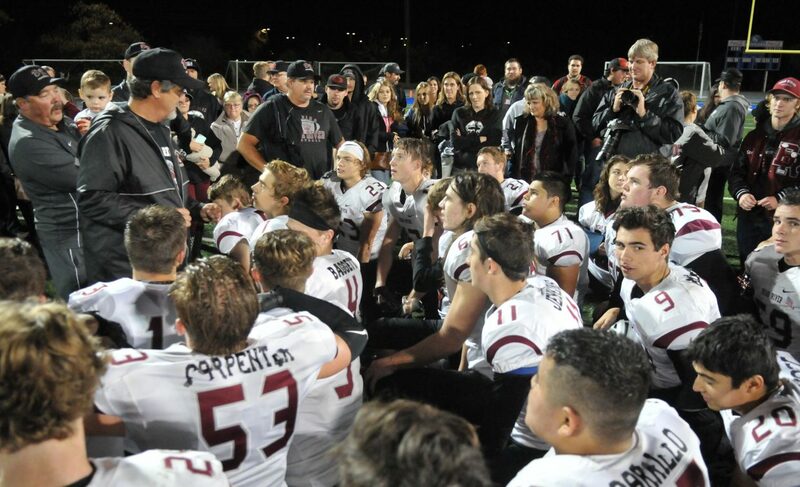 Bear River’s coaching staff congratulates team members on a well played, hard fought playoff game against the Capital Christian Cougars. 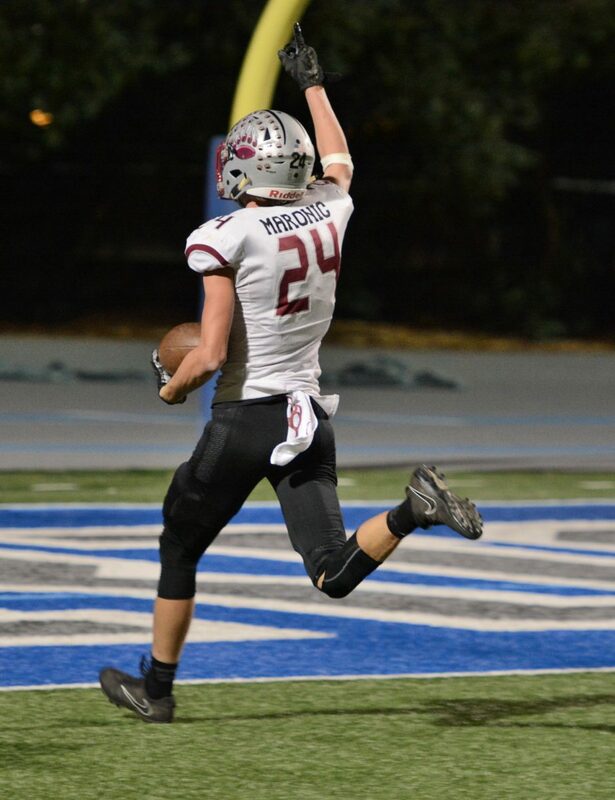 Bear River’s Tre Maronic (24) flys through the air to break up a Capital Christian pass intended for Ishmael Rehberg. 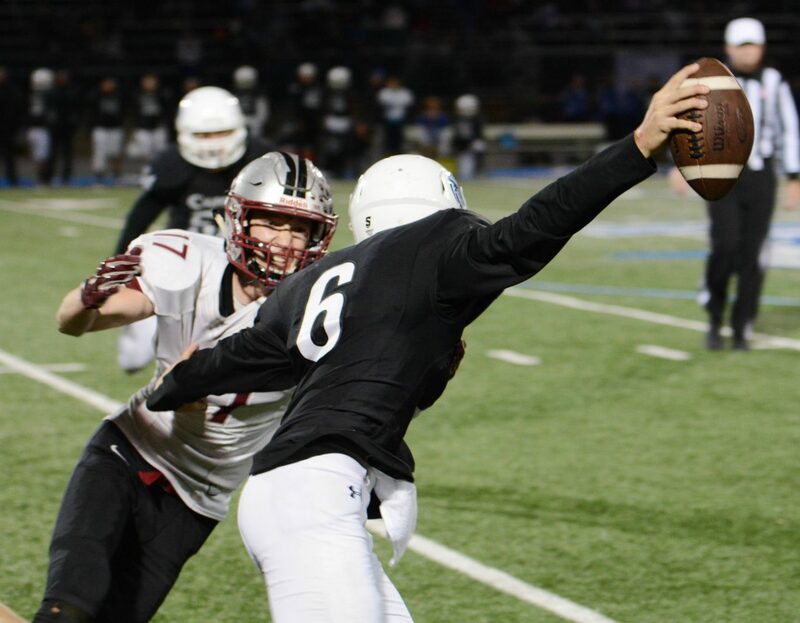 Bear River quarterback Luke Bagget (4) readies to throw a pass for the Bruins during Thursday night’s first round playoff win over the Capital Christian Cougars. 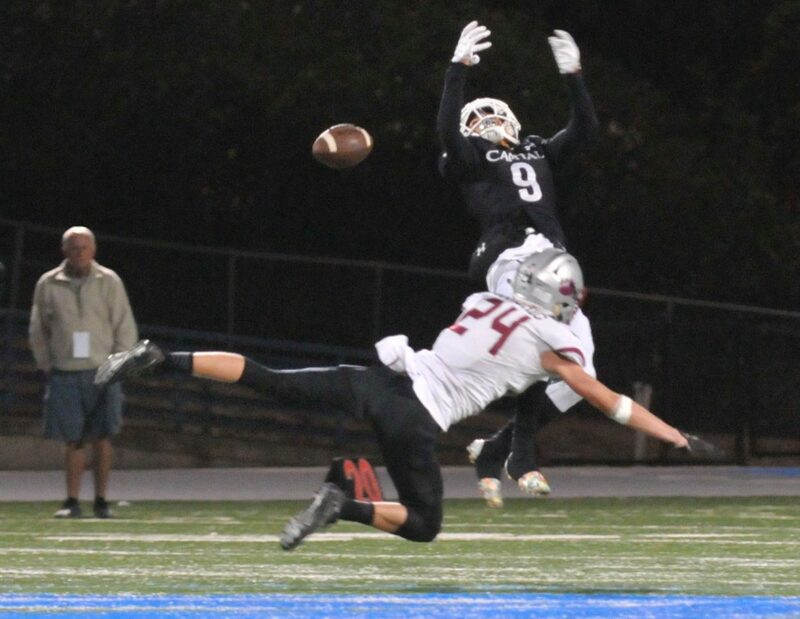 Bear River's Tre Maronic pulls down one of his two touchdown catches against Capital Christian Thursday. Bear River's Tre Maronic coasts into the ens zone for a 39-yard touchdown against Capital Christian Thursday. Bear River's Tre Maronic runs the ball during a playoff game against Capital Christian Thursday. Bear River's Austin Baze closes in on Capital Christian's quarterback during a playoff game Thursday. Bear River's Jake Leonard closes in on Capital Christian's quarterback during a playoff game Thursday. 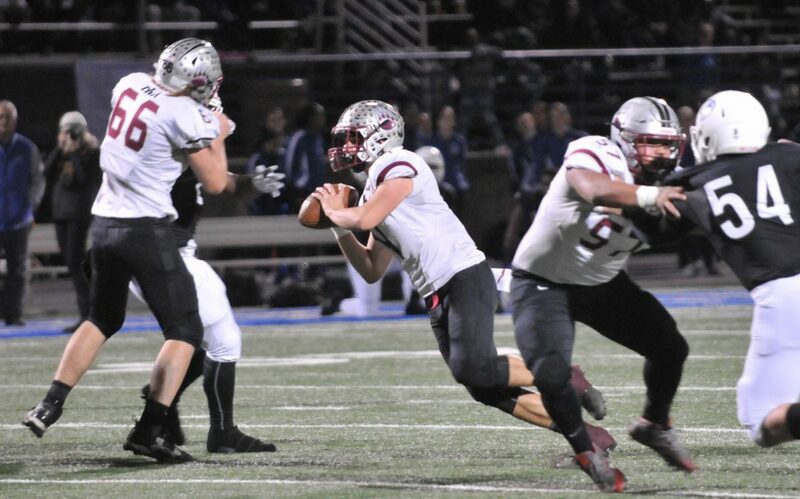 SACRAMENTO – Behind a tenacious defense, a balanced offense and an unquenchable hunger to win, the Bear River Bruins roared to victory in the first round of the Sac-Joaquin Section Division V playoffs. The Bruins hit the road Thursday and silenced the defending Sac-Joaquin Section D-V champs on their home turf, topping the No. 3 seed Capital Christian Cougars, 26-7, to advance to the semifinals. It was the Cougars (7-4) pouncing first, scoring on the opening play from scrimmage with a 77-yard hookup up from quarterback Jake Cruz to D’Marcus Ross, but the Bruins defense put their foot down thereafter, surrendering no more points and wrapping up 10 tackles for a loss, including seven sacks. 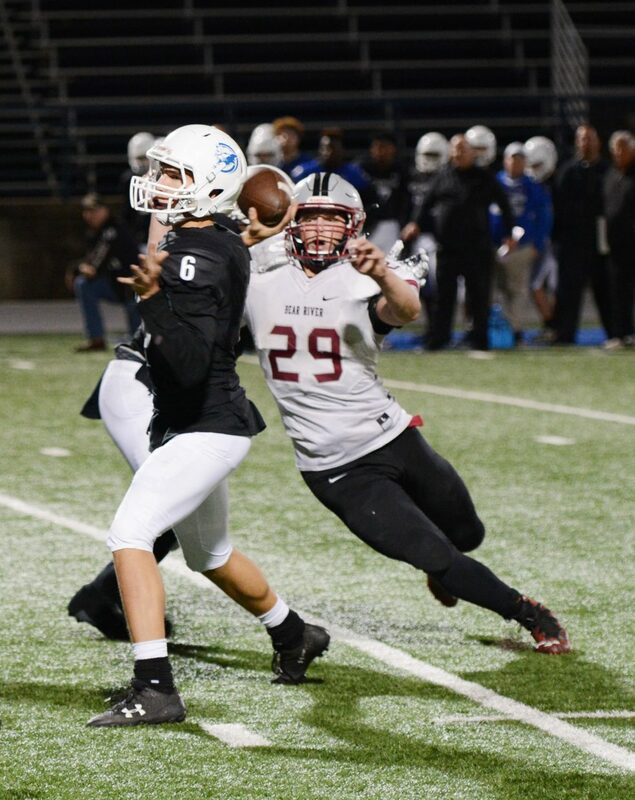 Senior quarterback Luke Baggett delivered a clutch performance, rallying his offense back to knot the game 7-7 with an 85-yard scoring drive capped off by a 19-yard touchdown pass to Calder Kunde with just under four minutes to play in the second quarter. 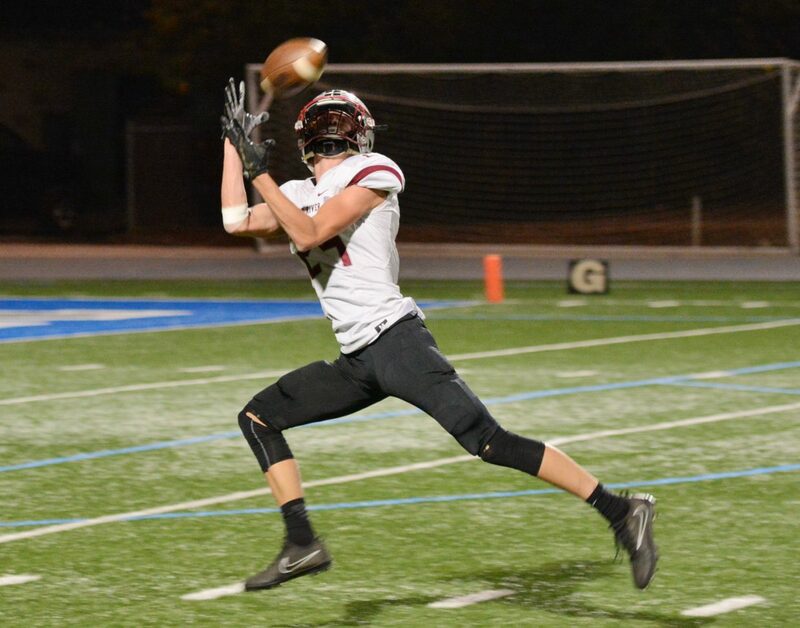 Tied 7-7 at the half, Bear River received the kick and its offense began to click, and the Cougars began to bite hard on play action passes. Just minutes into the third quarter, Baggett threw his second touchdown of the game, finding a wide open Tre Maronic for a 39-yard score and a 14-7 lead. Capital Christian had the playmakers, but Bear River stuffed every opportunity down the stretch. The Cougars netted just 16 yards on the ground. 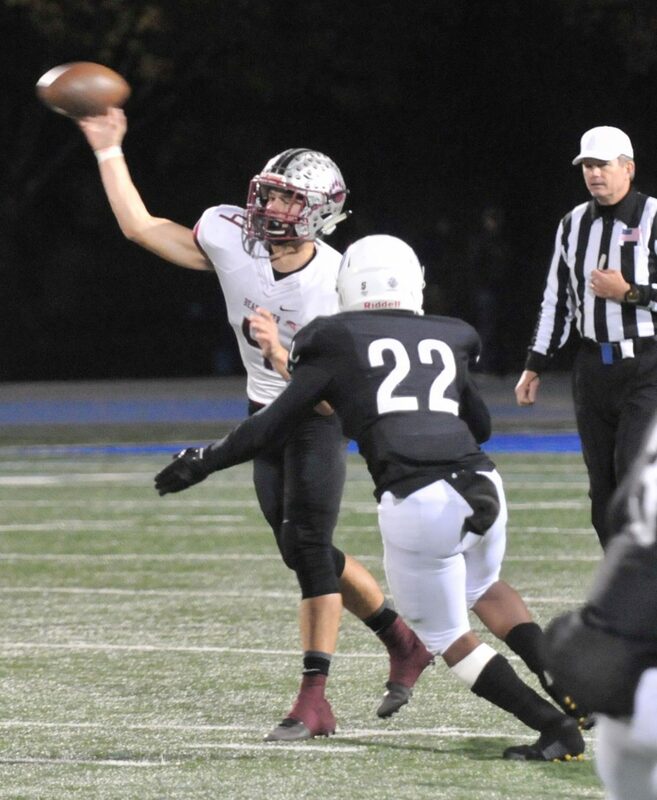 Ross, who came into the game averaging more than 100 rush yards per game was held to just 14 yards on 10 carries. Cruz passed 11-of-19 for 237 yards with a touchdown and an interception. After forcing a punt, the Bruins offense took over at their own 22 and went back to work, mixing runs and passes well to march deep into Cougars territory. Baggett would cap the drive by plowing into the end zone from 1-yard out to give Bear River a 20-7 lead. Another three-and-out by the Cougars set up the Bruins at their own 43. 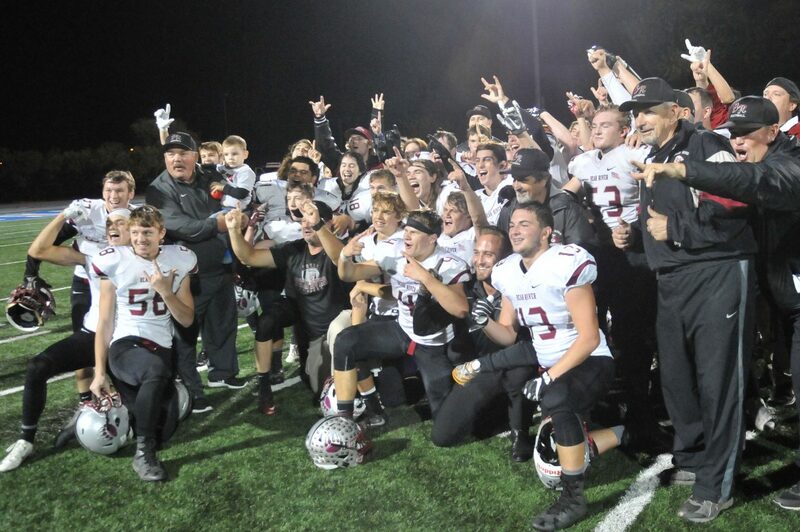 Eight straight running plays took Bear River down to Cougar 6-yard line and on third-and-goal, Baggett hit the outstretched arms of Maronic for another touchdown and a 26-7 lead. Rounding out the offensive attack for the Bruins was Kunde, who grabbed three receptions for 48 yards and a score, and Garrett Pratt, who had two grabs for 69 yards. Senior fullback Austin Baze kept the defense honest, drawing attention to the Bruins ground attack and opening seams for his teammates. He finished with eight carries for 38 yards. Defensively, the Bruins devoured the Cougars in a sack-fest coming from all angles. 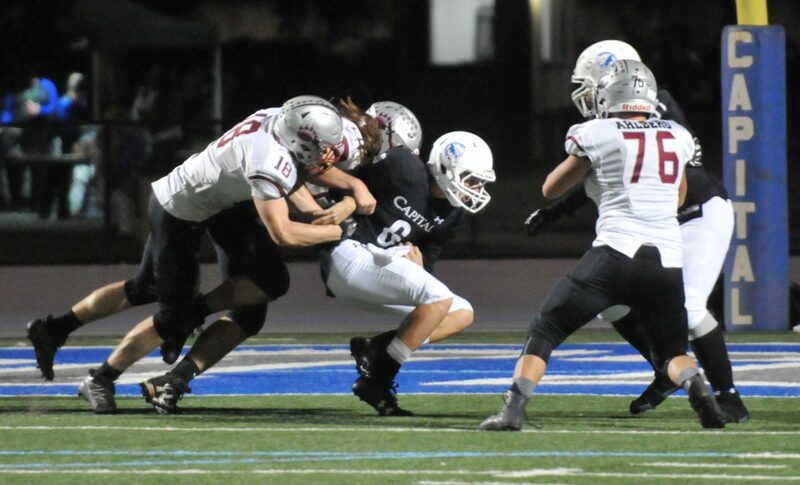 Defensive end Jake Leonard tallied two sacks to lead a Bruins pass rush that was in the Cougars backfield all night. 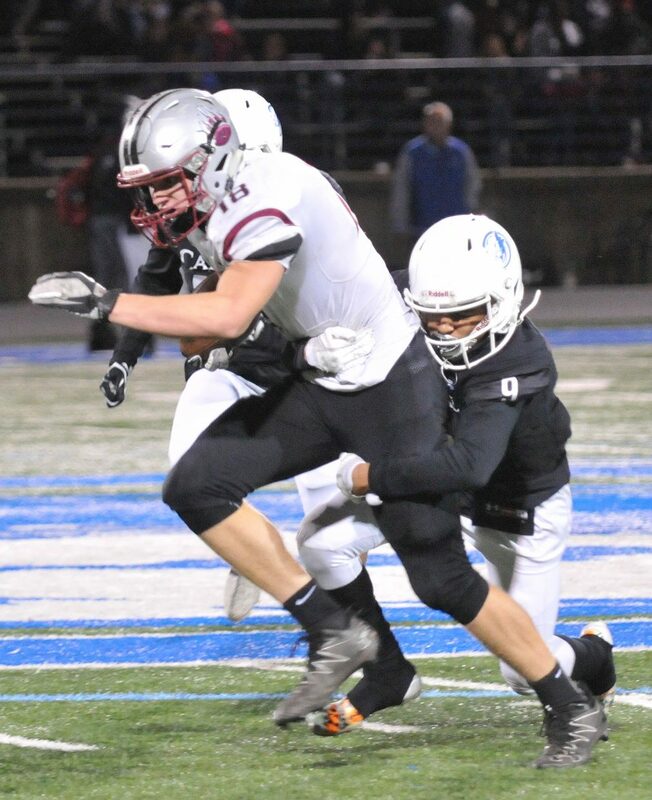 Middle linebacker Travis Carpenter led the team in tackles with 10, followed by Pratt with seven and Kunde with five. Kunde also nabbed a fourth quarter interception to foil a goal-to-go situation for the Cougars. No. 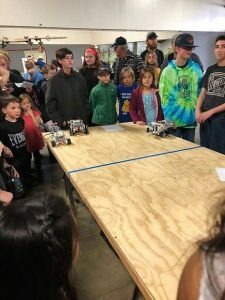 6 Bear River (8-3) now awaits the result of Friday’s No. 2 Calaveras vs. No. 7 Ripon matchup.